Rich search results are everywhere. Years ago, search engines presented search results without much adornment. Today, the search results look very different. We see extra information beneath the links, plus a couple of big blocks of rich content, depending on what you look for. The additional lines beneath results are called rich snippets, and they are meant to directly inform users. In this article, we’ll briefly go over the different rich snippets and what they mean for – mobile – SEO. First, let’s look at what regular snippets are. Snippets are the black lines of text beneath the title of the search result. Here you’ll read a piece of text introducing the individual search result. Rich snippets are the additional lines of information underneath search results; these often consist of breadcrumb links, product information, prices or reviews. Rich snippets are part of rich results; the catch-all term search engines use to describe parts of the search results that have a highlighted presentation. There are a couple of other enhancements to the search results pages. Rich cards on mobile, for instance, are a sort of follow-up or extension of rich snippets. These provide a lot more actionable information, directly from the search results page. Rich cards were until recently only available for movies and recipes, but have been expanded with local restaurants and online courses. If you want to know more, you should read this post about rich cards. In addition to that, there are also featured snippets. These are the boxes Google shows at the top of the page to answer a query directly. Last but not least, there’s the knowledge graph card; this is the big block of information on the right-hand side. 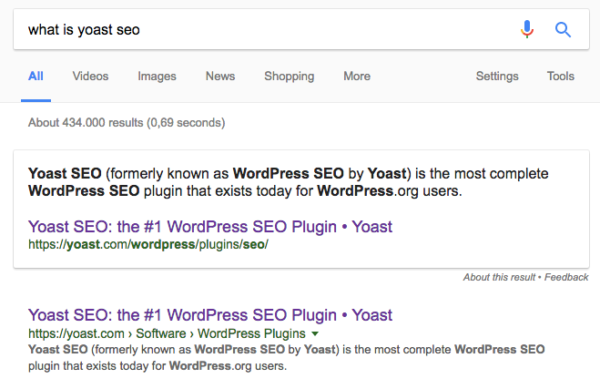 Our Yoast SEO plugin uses JSON-LD to add information about your site search, your site name, your logo and your social profiles to your web pages. What do rich snippets do? In addition to telling the search engine what all the pieces of your site mean, the main goal of rich snippets is to inform the searcher. A well structured rich snippet will entice the searcher to click on the link. Users can now judge directly from the search results if a certain result is the one they are looking for. Let’s say you have a business delivering flowers. You have done a lot of work to rank well in the search engines for the term ‘flower delivery’, appended with your location. You rank pretty well, but your competitor has rich snippets, and you don’t. He shows his reviews directly in the search results and his flower shop rates 4,5 out of 5 stars. His stars just naturally catch your eye. With his high rating, he might attract more clicks from searchers, just because he has a more ‘trustworthy’ profile. You know what you have to do. Do rich snippets have benefits for SEO? Adding structured data does not directly result in better rankings. It does, however, make you more visible in the search results. Search engines understand your pages better and can, therefore, give you a better presentation. This, in turn, might lead to more focused traffic, extra sales, links and in the end; better results from your site. If your listings get rich results, searchers will notice you better because you stand out from the crowd. This might lead to a higher click-through rate (CTR). In addition to that, if you’re snippets are really good, your bounce rate may potentially go down. The reason for this is that searchers can make a better judgment directly from the results. If your listing is not up to scratch, searchers might skip you. If it is, they know your listing should promise what it says. All you have to do is deliver the result it promises. Keep in mind that it’s up to the search engines to determine if your listings get rich results. There are no guarantees you’ll get them. There are different types of rich snippets. If we look at the broader palette of rich results, there’s even more to see. Here are the most prominent examples. You can see some of these in action in Google’s Search Gallery. Mark up products with Schema.org/Product and you can get rich snippets in search results. Your product can be enhanced with ratings, pricing, and availability, for example. In this post, we explain how you can enhance your product listings in search engines. Do customers give your business or product ratings? Then you could collect them on a review page and mark these up as ratings or reviews with Schema.org/Review. This way search engines recognize the reviews and might show them in the search results. We’ve written a post on reviews and ratings as well. Remember, you cannot use external reviews from sites like Yelp or Tripadvisor anymore, you have to collect them yourself. Your local business should present the correct structured data to search engines (Schema.org/LocalBusiness). If you use this data, search engines will pick it up and might highlight your business in the results. If you want to mark up your local business, you should read the article on local business listings. Don’t have the time or knowledge to add all this information yourself? Our Local SEO plugin can do it for you. You can now see recipes directly in the search results. If you are searching for a recipe for cheesecake, you can now find it without leaving the search engine. To activate this on your cooking site, you need to add Schema.org/Recipe data. Event listings have been around for quite a while. If correctly implemented clubs, venues or other social and cultural entities can show multiple upcoming events directly in search results. Check out Schema.org/Event. One of the latest additions is courses. By adding Schema.org/Course data you can highlight your course in the search results. Among other things, you can show a description, tutor, price and the institute that facilitates the course. You can find a couple of example sites, including markup at W3.org. It used to be fairly hard to add the data needed for rich snippets, but times have changed. There are now multiple WordPress plugins, online generators and other tools to add data without having to deep-dive into code. In addition to that, the new data format JSON-LD has made it much easier to write readable code that’s simple to understand and maintain. Still, if you don’t want to mess with code, you can always ask your web developer to do it for you. The last couple of weeks, we’ve been adding posts on working with structured data and JSON-LD. We have guides on ratings and reviews, product listings, local business listings and a small intro on how to work with JSON-LD. Shortly, there will be even more on this subject. Having said that, you should always be careful when adding structured data for rich snippets. If you markup hidden content, or don’t follow the rules one way or the other, you could receive a penalty. While adding structured data for rich snippets doesn’t directly lead to better rankings, it will lead to a better understanding of your site by search engines and visitors alike. As with a lot of SEO related things, you are still in the hands of search engines. They will determine if a site gets rich results or not. Don’t let this stop you, though. Adding structured data to your site is always a good thing because you are making your site clearer to search engines and thus creating a bigger chance of them presenting your site in the best possible way. Thanks Edwin, But in Indonesia still not active for Product Rich snippet, i use woocommerce and Currency using IDR, that’s available on Search Result with rich snippet? Just watch out when you implement reviews. Google is currently looking into them at punishes a lot of sites for “structured markup spam”. So remember to consult the Google Guidelines and make sure that you follow. Hi Frederik. You should definitely follow the rules in this case. Reviews are particularly precarious because Google recently said that you should collect reviews yourself. You can’t just take external reviews from Yelp or something to bump up your numbers. 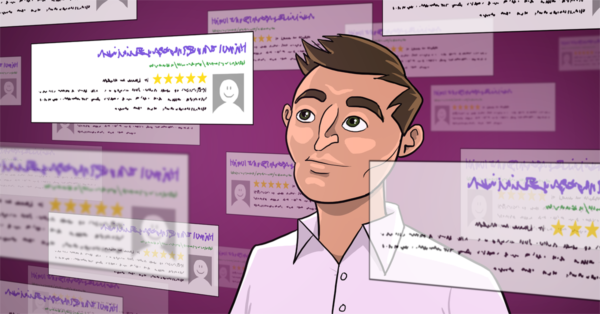 Collect them yourself, make them visible on a review page and markup that to get your reviews in the search engines. In addition to that, make sure that your markup is correct. Check it with the Structured Data Testing Tool. What if I added the snippets and still not working, how do you usually test it ? Hi Margaux. It could take a couple of weeks for Google to pick up the data. Even then, it’s hard to predict if the search engine uses the data to generate rich snippets. Just make sure your data is correct and keep your fingers crossed. Check this Google page for more information on testing your markup. Just updated my site with this – simple to do and great additional info. Search is moving more and more towards ‘one result, only result, best result’, where some machine learning algorithm (like RankBrain) will scan through the database and pull only one result, the best result. (Remember the “I’m feeling lucky” button?) I think Rich Snippets are a step towards that direction. Cool article. I use your plugin on every wordpress site I own! 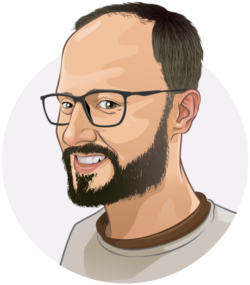 Thanks for sharing and keep up the good work at Yoast. I had not thought that snippets can help but after the article I am sure that they are influenced by many factors. Has anyone ever seen a rich snippet for jobsites? I’ve haven’t seen one yet. There is Schema.org for job listings, so maybe it can be done. You have to read up on that. I’ve read it already but still waiting to implement it because Google and other crawlers don’t seem to use this Schema.org (not for job listings).